Aiming to appeal wider audiences, BMW introduced the facelifted version of its popular roadster – the Z4 – in 2013. The car gets foldable hard-top, larger dimensions and better visibility, coupled with adjustable chassis, throttle and steering settings. It’s more mature, and improved than before. Available in two trims – sDrive 35i Prestige and sDrive 35i Design Pure Traction – the Z4 roadster is power-packed with the same 3.0-litre, 24V DOHC direct-injection petrol engine that did duty to the old model. The car received a few cosmetic changes in 2013, though the interior remains largely unchanged. The BMW Z4 has received various design awards and just look at it and you will know why it’s such a style master piece. BMW says the styling of the Z4 is a modern interpretation of a traditional roadster concept and we can’t help but agree with them. Although unmistakably a BMW with the four round headlights and broad kidney grille, the Z4 has its very own visual elements to make it stand apart amidst the crowd. The long bonnet really characterises the front end and the low belt line neatly flows towards the low slung rear end of this sports car. 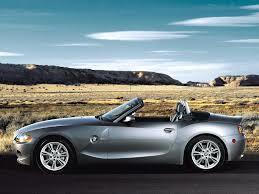 Top up or down, the BMW Z4 looks vividly exciting and the smooth flowing lines contribute to that feeling. Removing the top or putting it back up is a 19 second chore, which although automated, you do have to keep the button pressed, resulting in it feeling a tad too long for operation. The A-pillars are finished in black with the long wheelbase and delicious 18-inch low profile wheels really highlighting the car’s stance from the side. The rear evokes the most stares, the Z4 having a smooth derriere which is amplified by the neat trunk with robust lines. Twin exhausts (one each on either side) signal the intentions of this Roadster. With such a bold and defining exterior, it should come as no surprise that the interior is also just as bold and unique. The most noticeable thing hits you like a kick to the face – that two-tone nature of the cabin. The whole passenger side of the vehicle is essentially covered in what looks like orange Alcantara while the driver’s side looks to get a healthy dose of black leather and some black Alcantara. Needless to say, the colors really work well together and for part of the interior to match the exterior it just adds a bit of class into the mix. The other important part to note here is that the cabin is clearly focused on the driver. Not only does the black make this clearly visible, but so does the overall layout with all buttons on the center console positioned close to the driver. The screen and instrument cluster also seem to pop out at the driver, which is likely thanks to the unique steering wheel design and the massive overhang above the instrument cluster. The door trim panels are very deliberate in their design, and if you pay attention, you’ll notice that the insert around the door handle actually resembles the LED strip of the rear tail lights. The seats get a laser cut motif on the inner side bolsters while the Z4 logo has also been embossed on the seats. The steering wheel is quite unique in its own way, and while it does, technically, have a four-spoke design, only two of the spokes at the bottom are actually attached to the central hub. The side spokes extend toward the center but bend back, which at the right angle makes the rim of the steering wheel look kind of like it is floating around the hub. Ahead of the wheel sits an all-digital instrument cluster with two primary gauges that serve as a tachometer and speedometer. Two smaller digital gauges reside in the lower corners to display fuel and most likely engine temperature. To the right, you get what could be the next interpretation of BMW’s infotainment system. The screen looks thinner than those on the current model and is also slightly angled with the taller side closer to the driver – again, to help increase focus on the driver as opposed to the passenger. Two HVAC vents are actually integrated into the model that houses the HVAC controls and, while there are analog buttons below the vents, a digital screen displays temperature settings in the middle. The center console features a traditional style shifter while the control knob for either the infotainment system of drive modes sitting just to the right. Quite honestly, I’m surprised this knob isn’t positioned further back and closer to the driver.All told, this is a very attractive cabin with a unique take on the two-tone language. Hopefully, since the cabin isn’t all that futuristic, we’ll see lots of the concept make it into the production model. After all, Bimmer did say that it previews its future design language, so we shall see. The 2016 BMW Z4 sDrive28i features a 2.0-liter turbocharged four-cylinder that produces 240 hp and 260 pound-feet of torque. Rear-wheel drive is standard, and you can get either a six-speed manual or an eight-speed automatic at no extra cost. Manual-equipped cars include an automatic stop-start function that turns off the engine when the car is stopped to improve fuel efficiency. In Edmunds performance testing, a manual-equipped Z4 28i went from zero to 60 mph in 5.8 seconds, which is similar to what the V6-powered Mercedes SLK350 runs. EPA-estimated fuel economy is 26 mpg combined (22 city/34 highway) with the manual, with a 1 mpg drop in highway mileage for the automatic. The Z4 sDrive35i gets a 3.0-liter turbocharged six-cylinder that produces 300 hp and 300 lb-ft of torque. It’s paired exclusively with a seven-speed automated manual transmission known as DCT. BMW estimates that the Z4 will hit 60 mph in 5.0 seconds. EPA estimated mileage is 20 mpg combined (17 city/24 highway).The Z4 sDrive35is gets a more powerful version of the 3.0-liter turbocharged six-cylinder good for 335 hp and 332 lb-ft of torque. DCT is the only available transmission. In Edmunds testing, the 35is went from zero to 60 in 5 seconds flat. Fuel economy ratings mirror those of the 35i at 20 mpg combined (17 city/24 highway). This series is blessed with a reliable braking mechanism. All its wheels are equipped with ventilated disc brakes, which are highly efficient and works precisely. This is further assisted by anti lock braking and electronic brake force distribution to help boost this mechanism. The cornering brake control reduces the chance of instability, which can take place when applying brakes whilst cornering. It has traction control programs as well. Its axles are equipped with an adaptive suspension that helps in keeping it well balanced. On the other hand, its steering column with servotronic assistance ensures good response and makes maneuvering easier for the driver even in heavy traffic. It is tilt adjustable and supports a minimum turning radius of 10.6 meters. The Z4 comes with all the safety you’d expect, including front and side airbags, although the nature of the car means there are no curtain airbags. There are fixed roll-over hoops behind the head restraints. Independent safety experts Euro NCAP haven’t tested the Z4.Standard security equipment for all models includes deadlocks, locking wheel nuts and an alarm.Safety in Z4 is as good as it gets in this range. Front and side airbags (driver and passenger both), ABS (Anti-lock Braking System), CBC (Cornering Brake Control), DSC (Dynamic Stability Control), DTC (Dynamic Traction Control), Roll-over protection system, Runflat tyres with range indicators, Three-point seat belts and lastly crash sensor with side-impact protection all are standard affairs. When you consider the fact that the BMW Z4 has always pretty much spoken for itself and generally has its own foundation of fans – much like the Mazda MX-5 Miata and the Honda S2000 always have – it’s a little surprising and even almost a little tedious to debut a concept this far into the research and development process. We’ve been seeing the test mules for both the Toyota Supra and the next-gen Z4 as far back as January of 2016, so it has to be near-ready for production. It would have been more feasible to bring a near-production-ready prototype on Monterey Car Week instead of this crazy concept. Of course, we’re hoping it really does preview what’s to come, and one with a Targa-style roof would be absolutely amazing. The exterior design of the concept is fresh, attractive, and has just the right mix of sportiness and aggression.